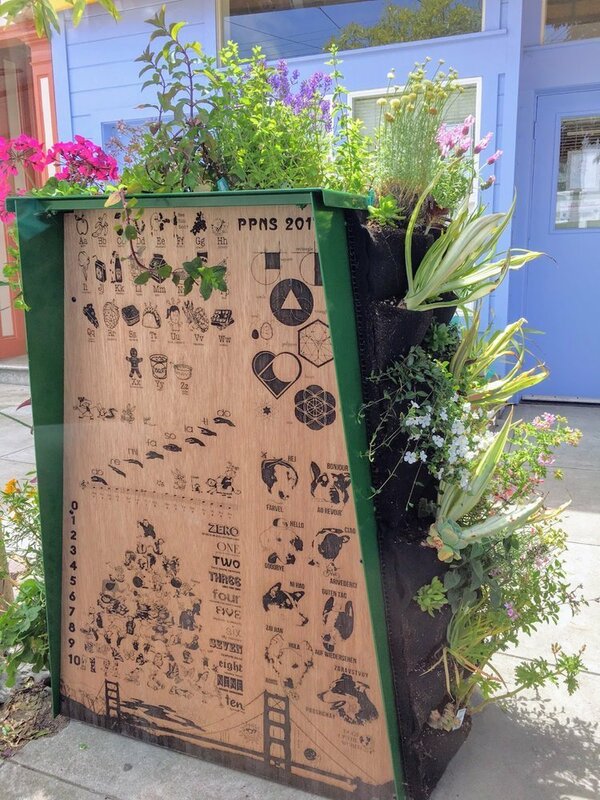 Florafelt Vertical Garden by by Alec Hawley for San Francisco Inner Richmond Little Free Library. 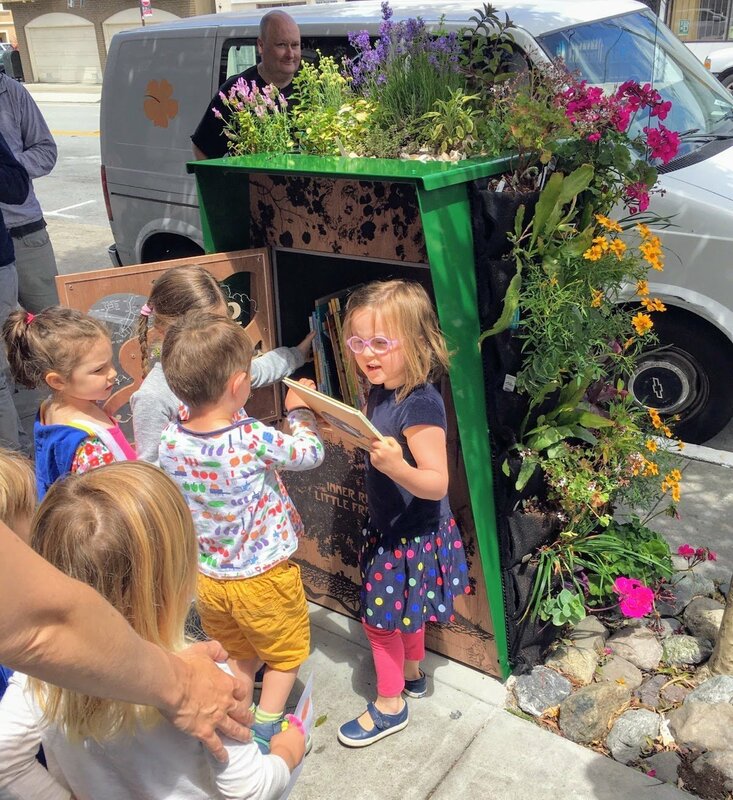 Kids love their new Tiny Library in San Francisco’s Inner Richmond Neighborhood. This little treasure was conceived by landscape architect, Alec Hawley and crafted by Richard Walker. 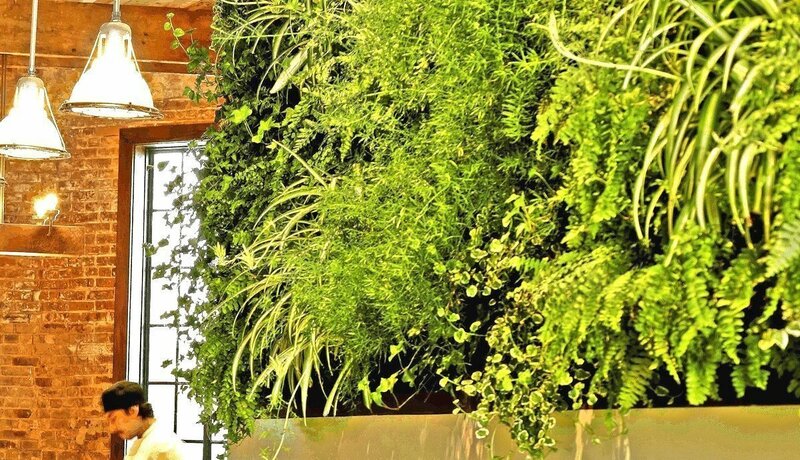 Florafelt Vertical Garden 4-Pocket Planters create little living walls on each side. The project was a community led effort to improve our neighborhood and make space for our youngest and most curious residents. 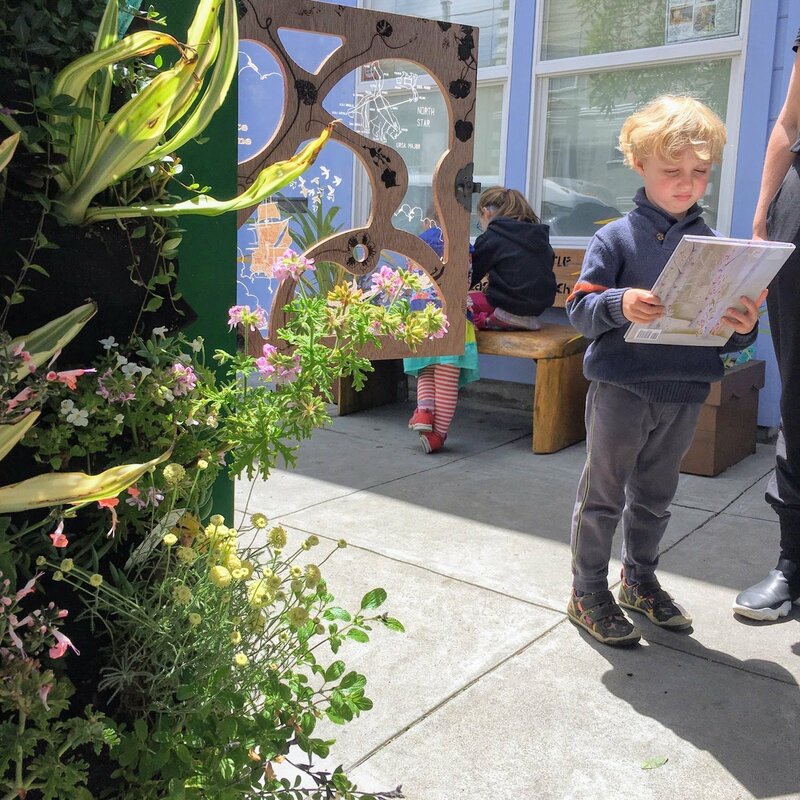 It not only serves as a Little Free Library, but also as a teaching tool and a sensory and edible garden for the entire Inner Richmond neighborhood. 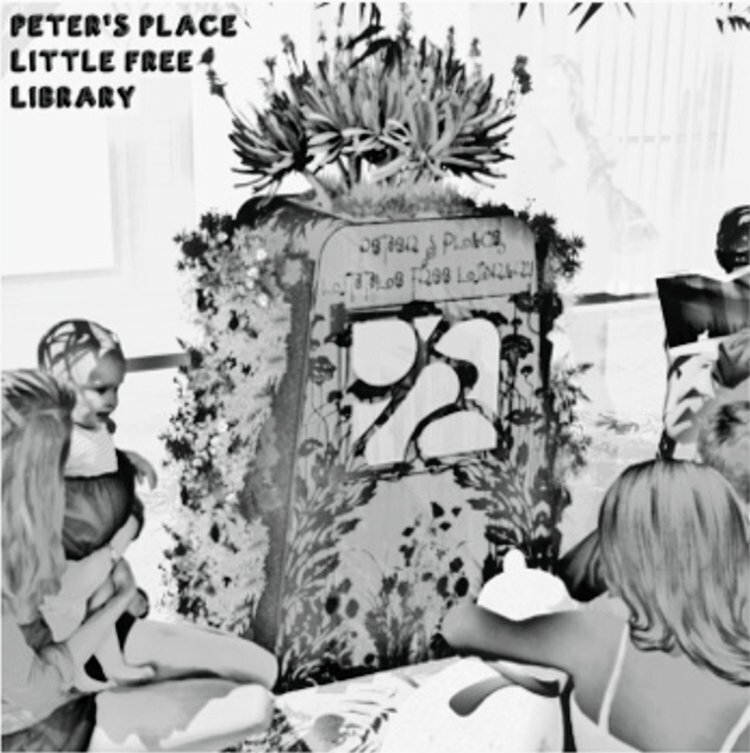 This library is the culmination of eight months of discussion, design & effort by the Peter’s Place Nursery School Parents and Teachers. 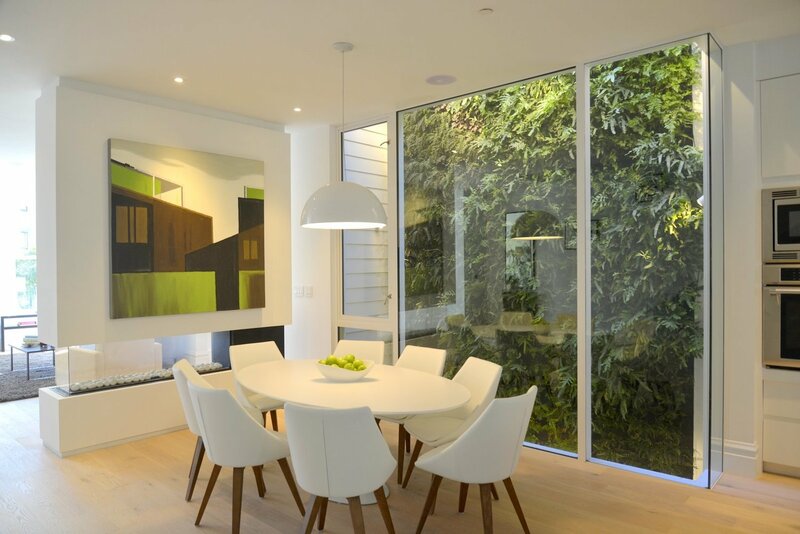 Design by landscape architect, Alec Hawley. Fabrication by Richard Walker. 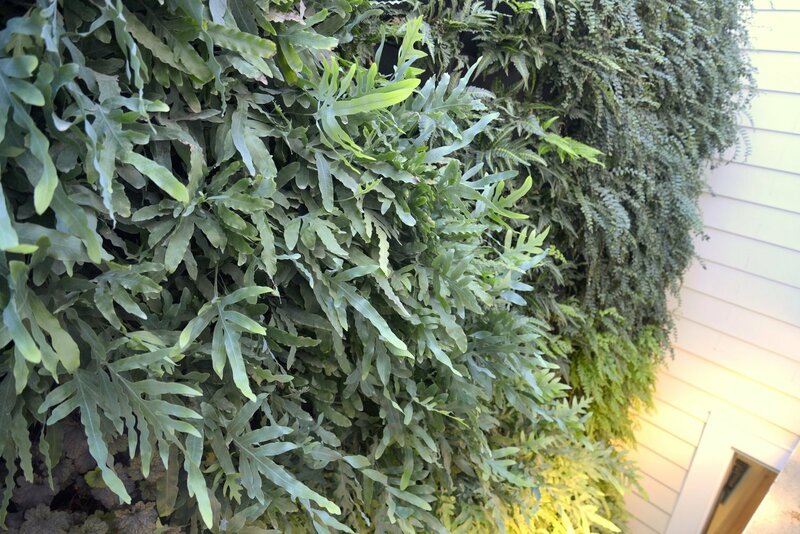 Living walls created with Florafelt Vertical Garden Planters. The tiny library is located at 227 Balboa St., San Francisco, CA. 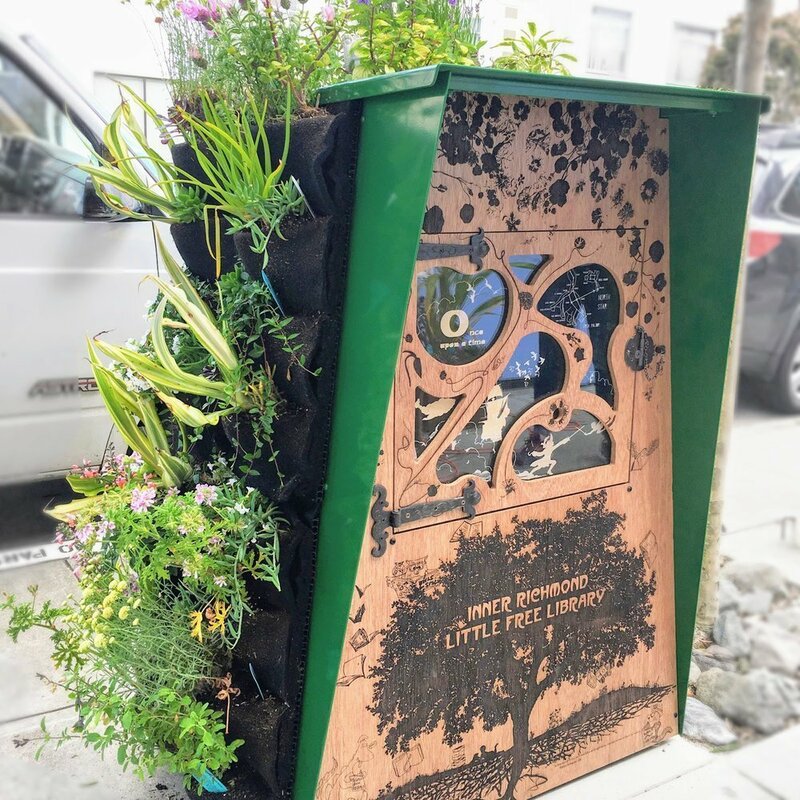 San Francisco Inner Richmond Little Free Library by Alec Hawley. 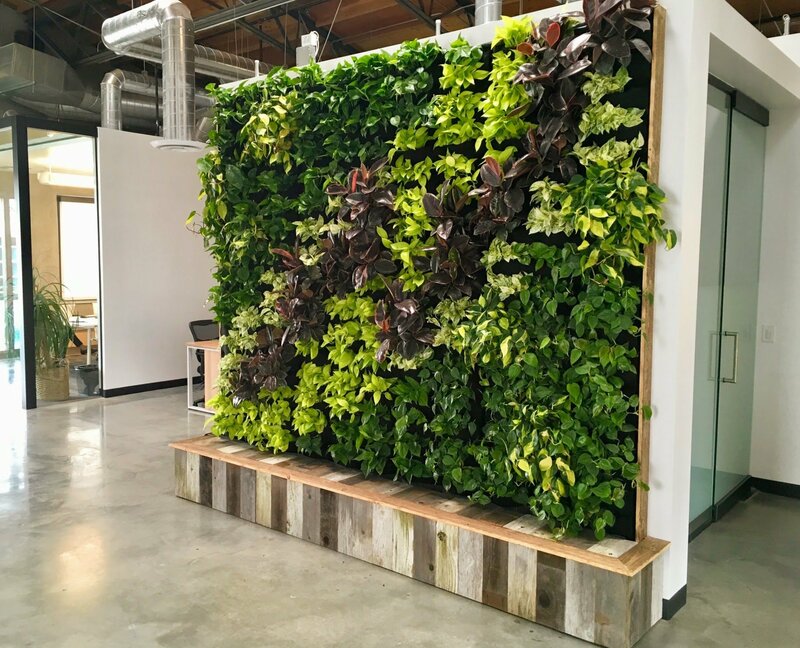 A luscious green plant wall at Yoobi Headquarters is an elegant air cleaner while producing oxygen. This custom Florafelt vertical garden created by Tucker Warner recirculates water from a storage tank at the base that is cleverly hidden with a beautiful enclosure of reclaimed wood. 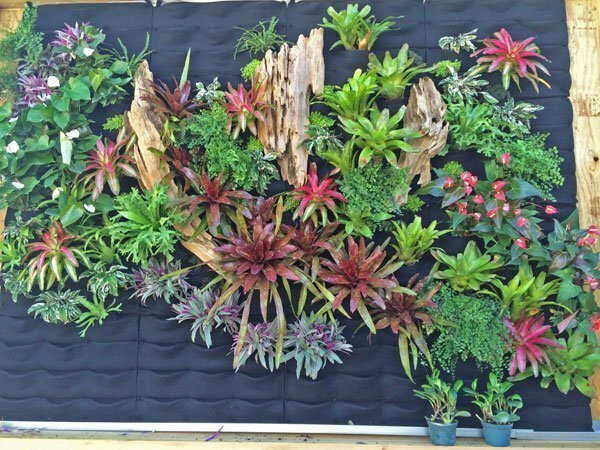 Hand-made living walls by Kieselbach Woodworks Hawaii. Made with Florafelt Pocket Panels. Dear Plants On Walls, Hope you have been doing well. I wanted to catch you up with the happenings with your fabulous product. 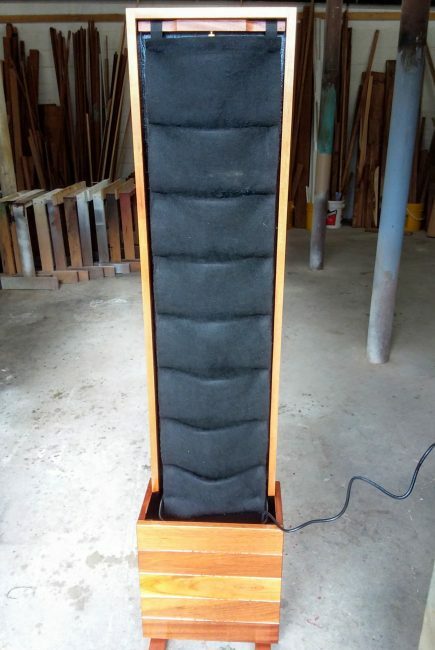 Last month was kind of a ‘launch’ of the 8-pocket system in an African mahogany frame. The first one we donated to St. Clement’s School for their ‘live’ auction item at the annual fundraising dinner (they painted and made their frame more custom, as pictured). It was fun to attend the event and watch the parents bid on this ‘priceless’ item as they term it. 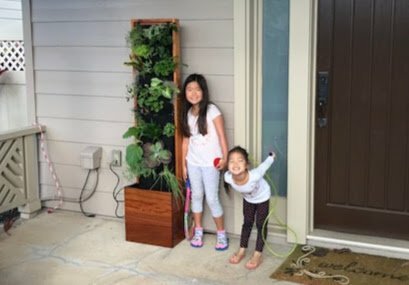 The photo with the two children is the special planter installed at their house. The system we have set up in our office is fully edible and provides greens for 2-3 people every 4-5 days. The final set of photos is a rooftop patio here in Kaka’ako. It definitely adds to the outdoor bbq/patio area in the urban core of Honolulu. The wood systems are catching on slowly and we have sold a few last month for the start. They are made of African mahogany and have a liquid rubber waterproofing liner. The rod holding the pocket insert has a thumb scroll to easily remove for cleaning or anything you may need. So with the whole kit inserted and extra water proofing, we are seeing interest by luxury condominium dwellers. Thank you again for working with us! 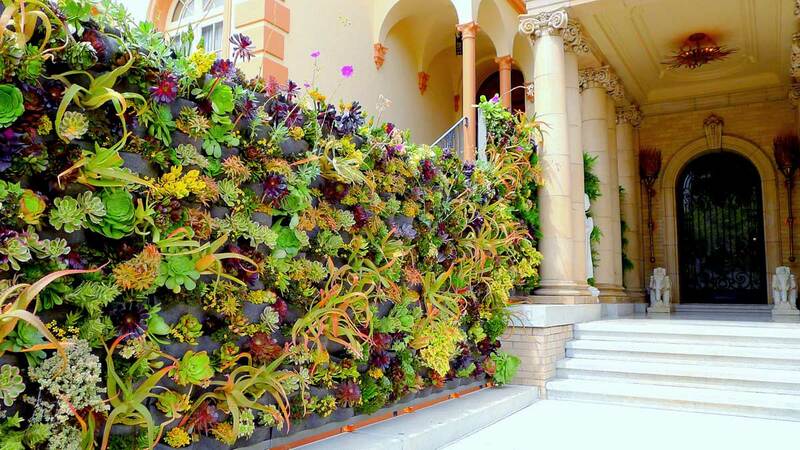 Succulent vertical garden by landscape architect Alec Hawley using the Florafelt Pro System. 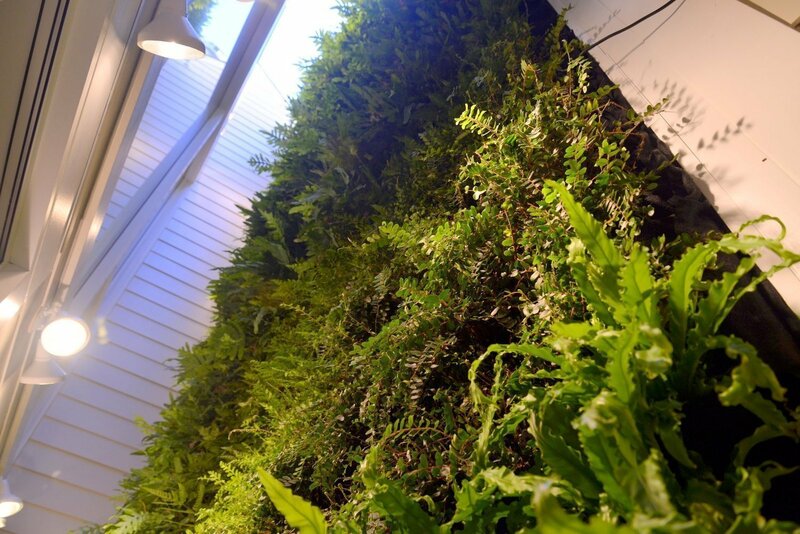 Landscape architect Alec Hawley explores a dynamic collection of succulents for his own backyard living wall using the Florafelt Pro Vertical Garden System. Alec experimented with a wide variety of succulent species to identify the most successful for the environment. A year after planting, nearly all have thrived and a sweeping expanse of color and texture creates a dynamic and exciting landscape element. A wide variety of species are artfully mixed together create delightful experience. 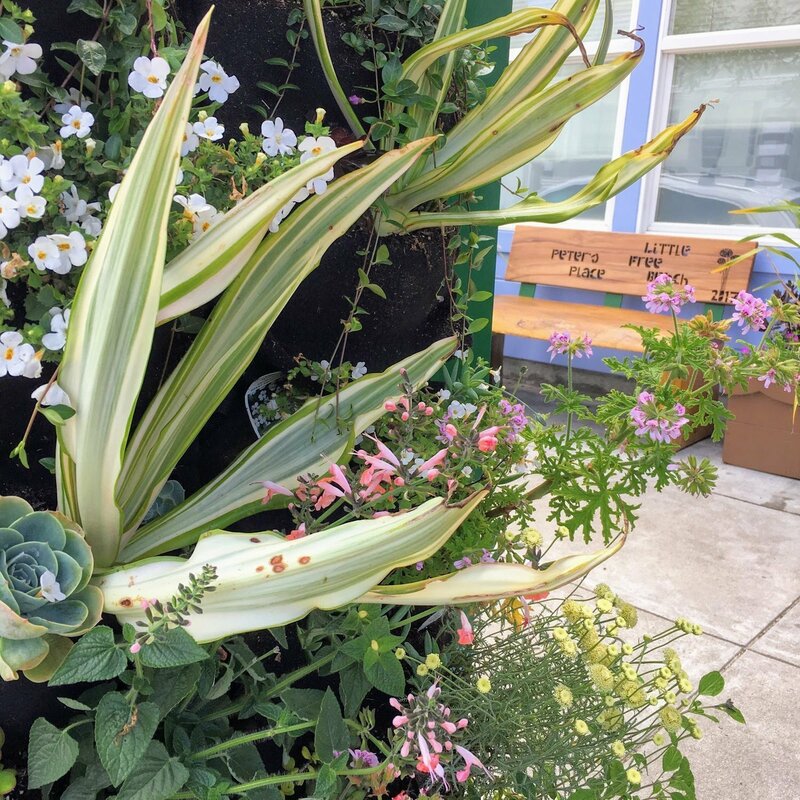 The succulent garden is the focal point of the yard and provides a backdrop to the children’s play area. It’s an inspiring place to discover and learn. Florafelt Vertical Garden at the Conservatory of Flowers, San Francisco. Maintained by Steph Kantorski, Volunteer Horticulturist. A redesign of the vestibule in San Francisco’s historic Conservatory of Flowers has created a breathtaking introduction for visitors to this world-famous Victorian structure. 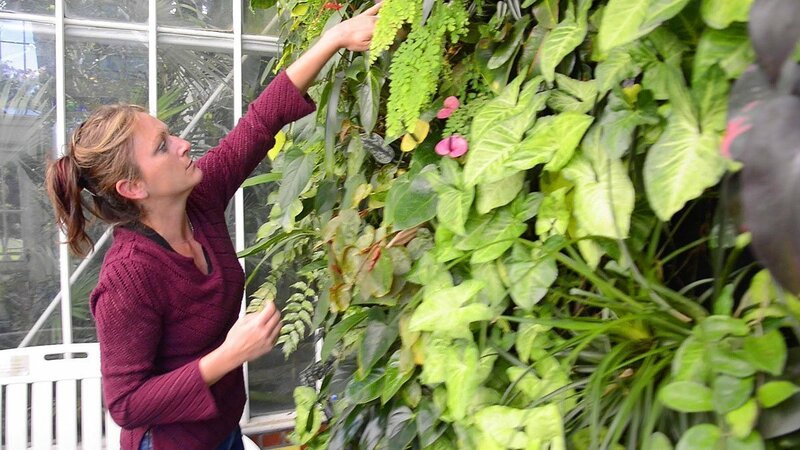 One of the largest and most beautiful vertical green walls in the city is now on full display for visitors inside North America’s oldest public wood-and-glass greenhouse. Florafelt Vertical Garden at the Conservatory of Flowers in San Francisco. 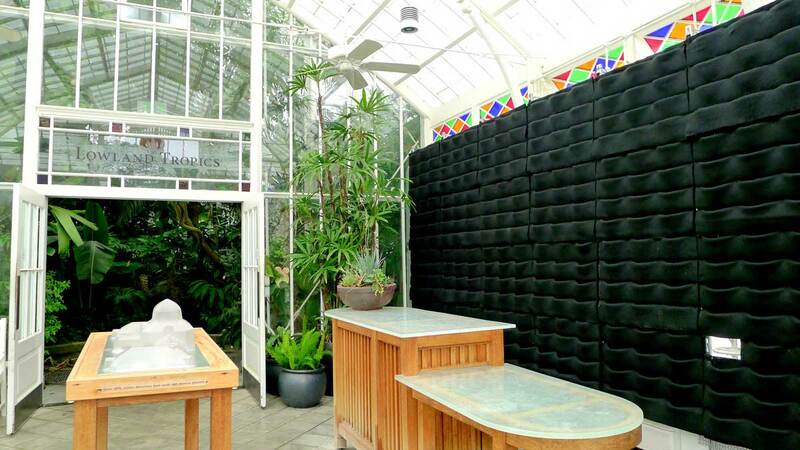 This dramatic 360-pocket wall (created with 30 Florafelt 12-pocket panels) reflects the spirit of the Conservatory. It was created with donated materials and labor by people with an enthusiastic love for plants. 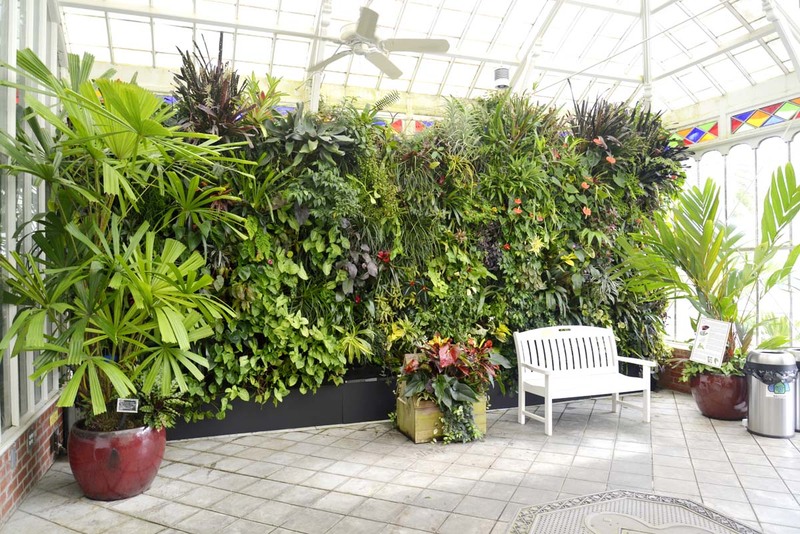 The result is an exquisite display of tropical greenery, flowering varieties and colorful vines for a luscious eye-catching wall that stirs the imagination. 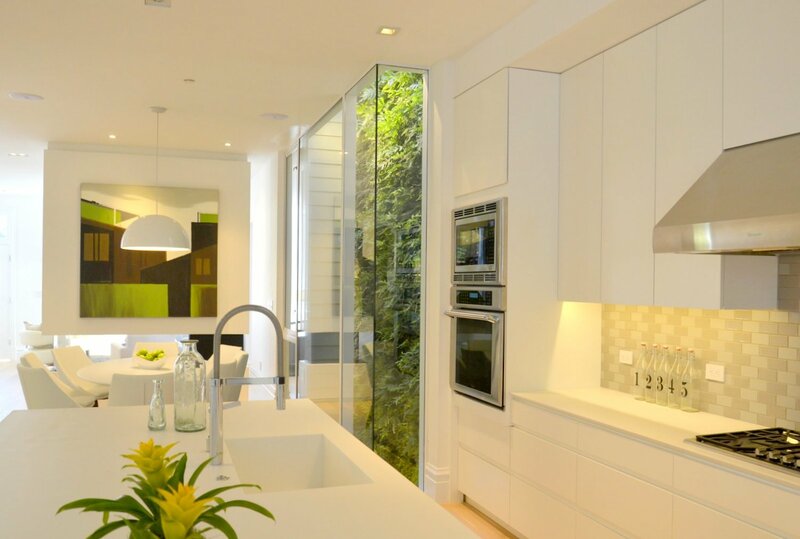 Florafelt Vertical Garden by Davis Dalbok, Living Green Design. Decorator Showcase 2012. 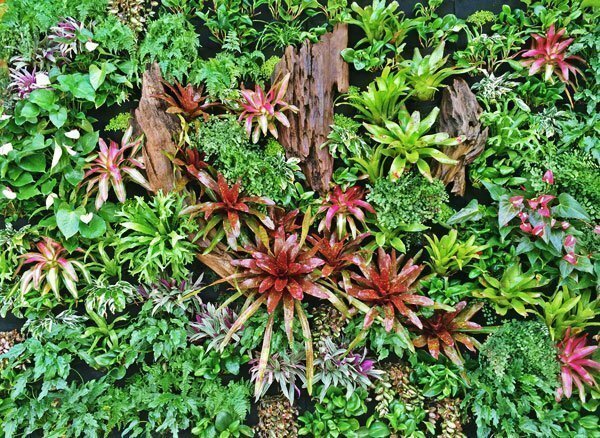 It all began with the 2012 San Francisco Decorator Showcase that featured an exterior green wall designed by Davis Dalbok of Living Green Design and member of the Conservatory’s Advisory Council. 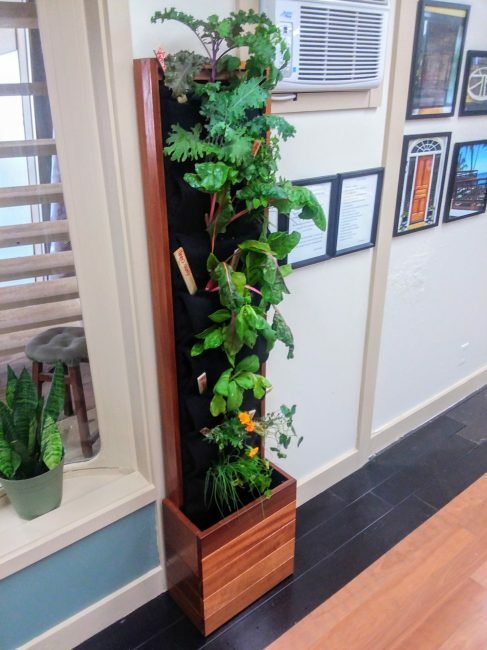 The planted entry wall was made using the Florafelt vertical garden system invented by Chris Bribach of Plants On Walls. 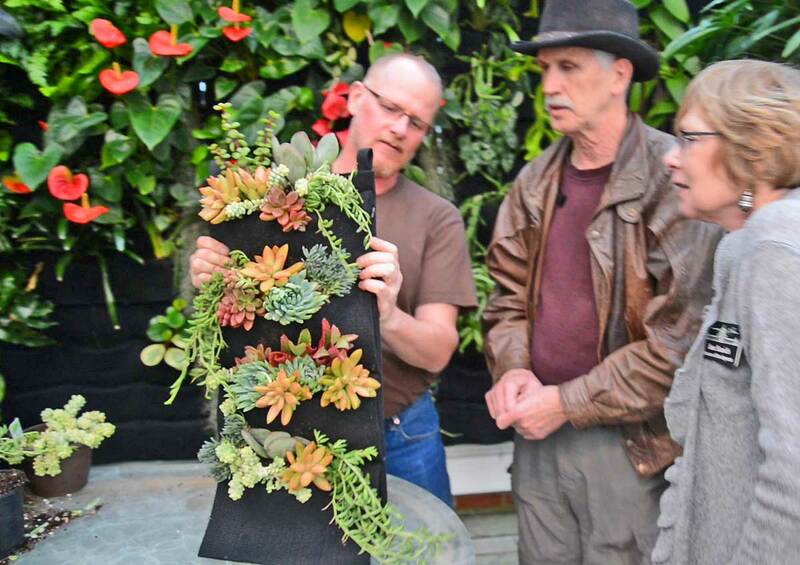 Florafelt Vertical Garden Simple Succulents Demo by Chris Bribach, Plants On Walls at the Conservatory of Flowers, San Francisco. 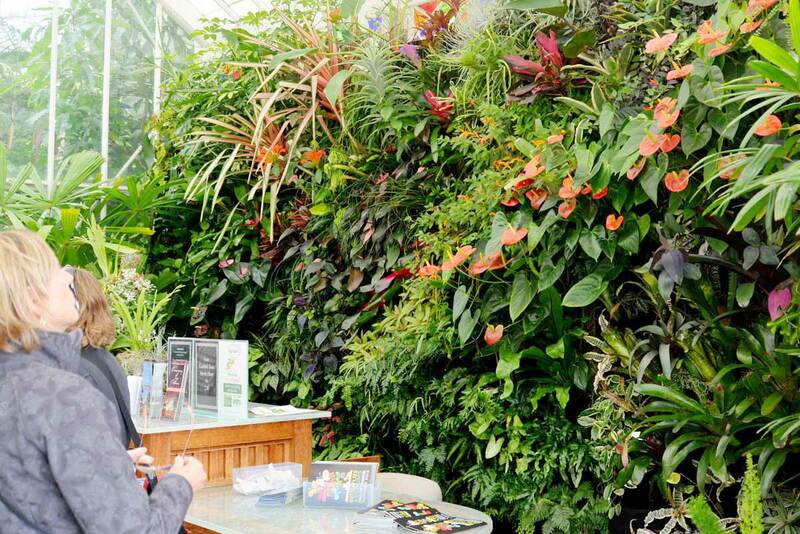 Jane Scurich (above right), Director of Development at the Conservatory of Flowers, remembers the Decorator Showcase wall as “breathtaking.” After the event, she asked Davis about acquiring a section of the display. Davis replied, “You don’t want a postage stamp, Jane, you want it to be the whole wall.” Davis contacted Chris about the project, who donated a custom-designed system to one of San Francisco’s most prestigious and beloved institutions. It was installed behind the greeter desk with special requirements to preserve the integrity of the elegant Victorian structure. 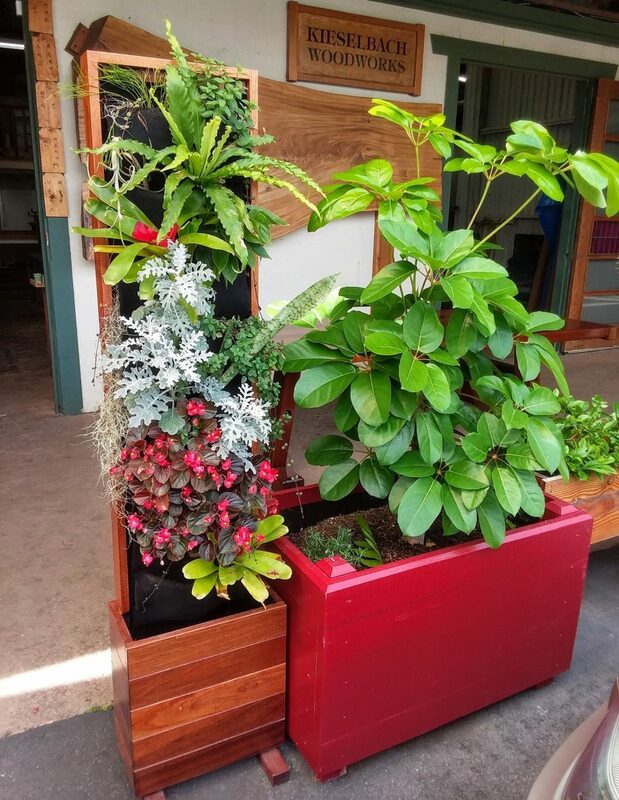 Florafelt Vertical Garden Planters donated by Chris Bribach of Plants On Walls. Conservatory Of Flowers, San Francisco. Around that time, volunteer Conservatory greeter Marilyn Singer passed away and her family donated many of the first plants in her memory. Later San Francisco Foliage donated more greenery. 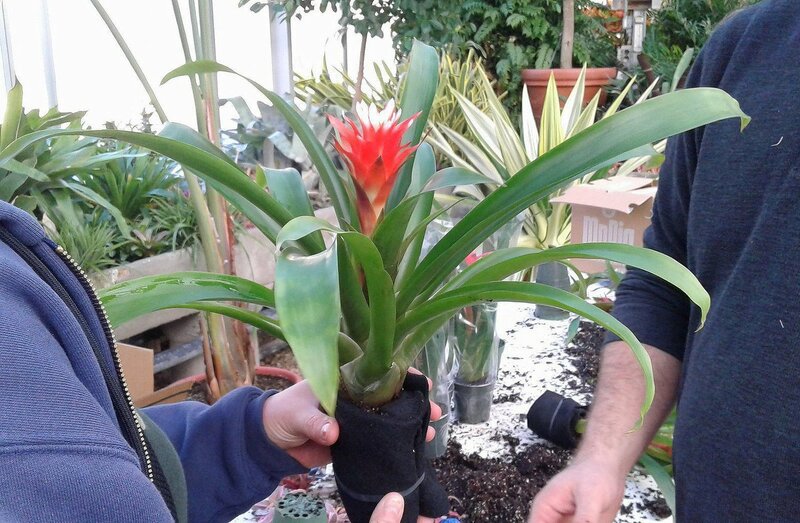 Senior Nursery Specialist Guadalupe Cota culled prime specimens from her greenhouse. As the number and variety of plants grew, it became clear that a stunning attraction was being created. A drip line water and nutrient-delivery system also donated by Plants On Walls kept it lush and beautiful. Not long after, Guadalupe left the Conservatory and Nursery Specialist Mario Vega maintained it for the next few months. That’s about where I came in. Originally volunteering as a docent, I switched to the horticulture side in 2013 out of sheer fascination with the plants themselves. 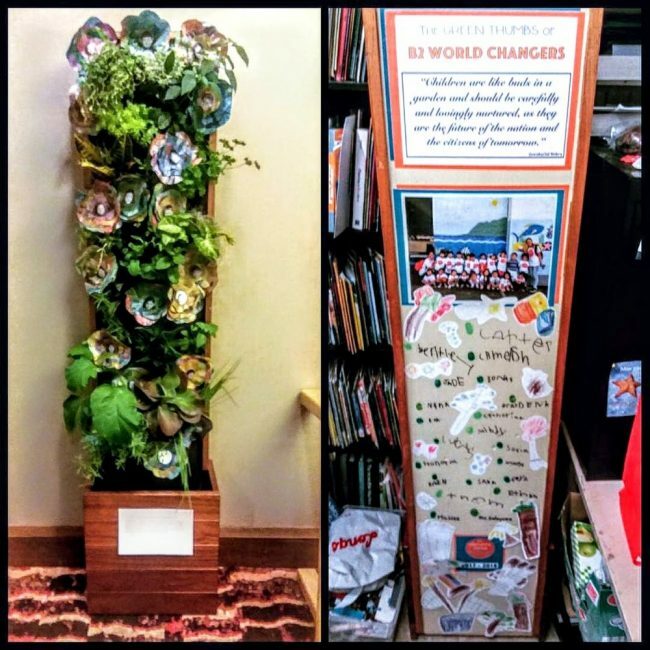 I was beyond thrilled when Mario put me on “vertical garden duty.” The last three years have been an invaluable education in what tropical flora do when prepared in Root Wraps, or the recycled PET “diapers” (as I affectionately call them), and stuffed inside pockets to grow vertically. 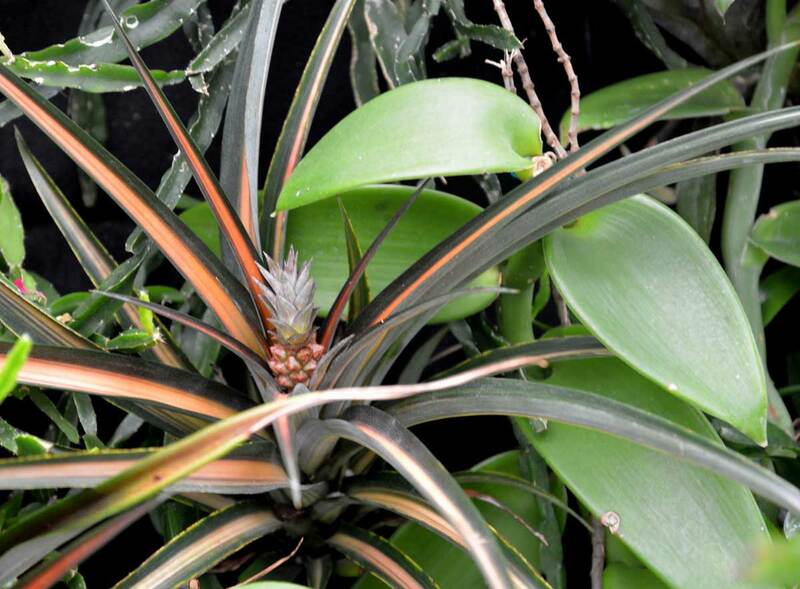 Florafelt Vertical Garden growing Pineapple and Vanilla Orchid at the Conservatory Of Flowers, San Francisco. As I worked with the vertical garden, I found that plants were so happy they began to take over. The vanilla orchid vine grew with such force it pushed its neighbors up out of their pockets. The bromeliads flowered furiously and the philodendrons’ roots clamped on so ferociously I had to cut out entire pockets. Gesneriads, lipstick vines and exotic grasses spilled over and fought for light. When the wall garden was finally tamed, I added more specimens to vary the color and texture. Now there’s a habanero pepper plant and two carnivorous Nepenthes, which I keep neatly trimmed because they tend to take over. Matthew Stephens, Director Conservatory of Flowers. 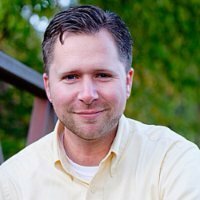 In early 2016, the Conservatory welcomed its new Director Matthew Stephens. 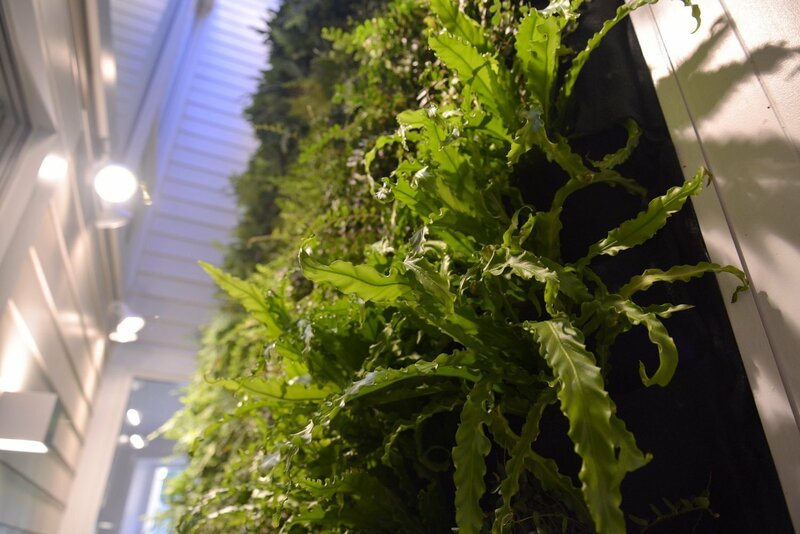 Among his other exciting plans, the greeter desk was moved to the other side of the entryway allowing everyone to experience the living wall up close. The larger foliage at the top has been trimmed to reveal the building’s beautiful original stained glass. With the wall now on full display, this unique and astounding vertical jungle finally feels complete. For a small entry fee you can visit the Conservatory of Flowers and take a free tour or stroll around on your own. 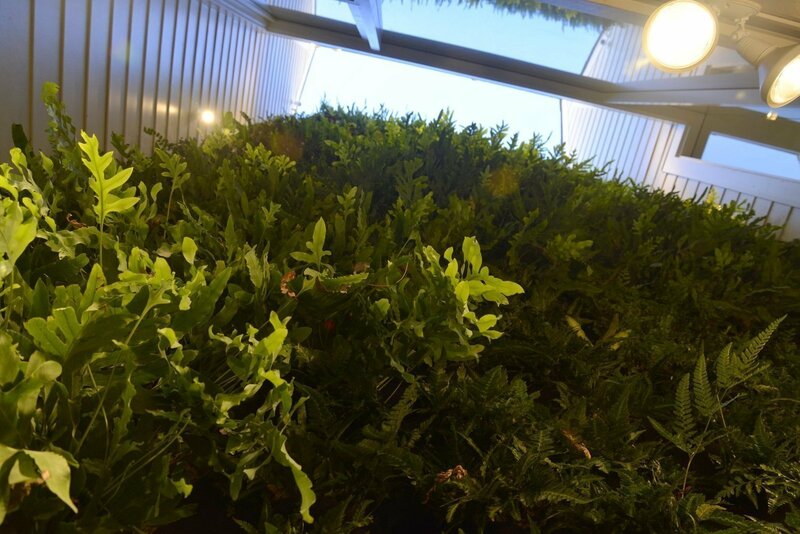 You can also just step into the vestibule without a ticket to experience the living wall for yourself. Florafelt Vertical Garden at the Conservatory of Flowers, San Francisco. Hibbity Dibbity band photoshoot. 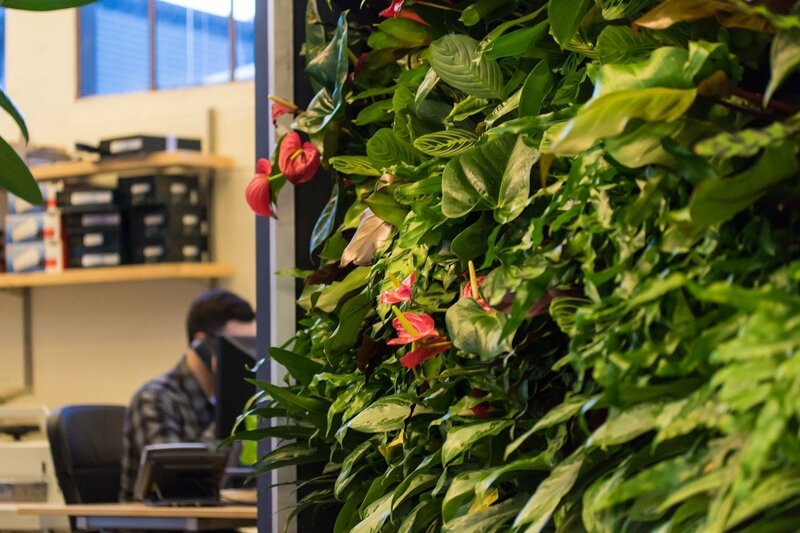 Florafelt Vertical Garden by Rebecca Sheedy, Floraform Design for Marx Foods, Seattle. 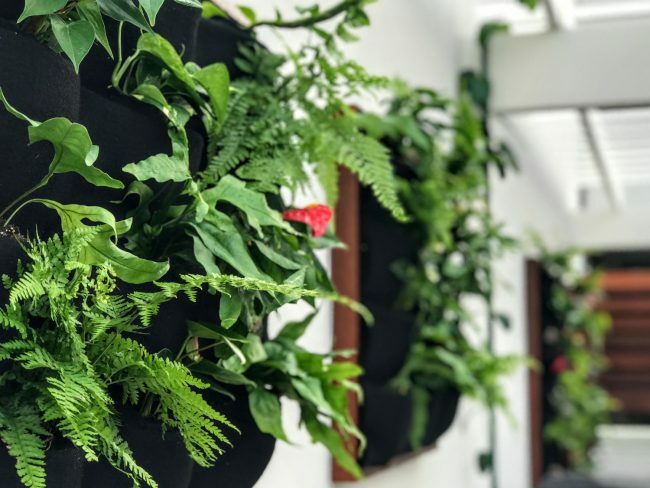 Rebecca Sheedy of Floraform Design is thrilled that her first vertical garden is also one of her most visible. 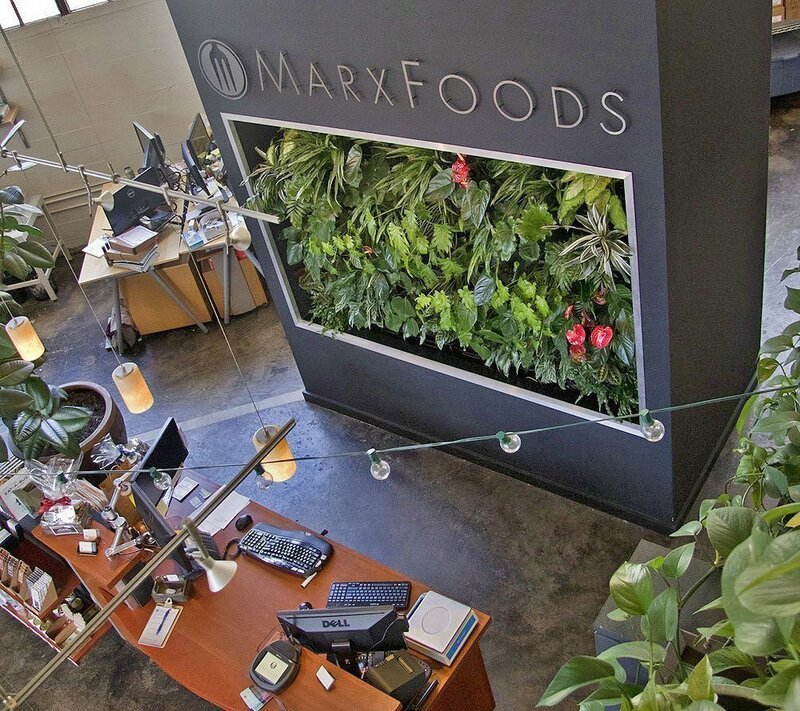 Marx Foods may be the first, but Rebecca has since spent five years creating living walls, and ran a business maintaining gardens for several years before that. “I just love plants and always find a way to be out there with them,” she says. Rebecca Sheedy with a Patric Blanc in Paris. 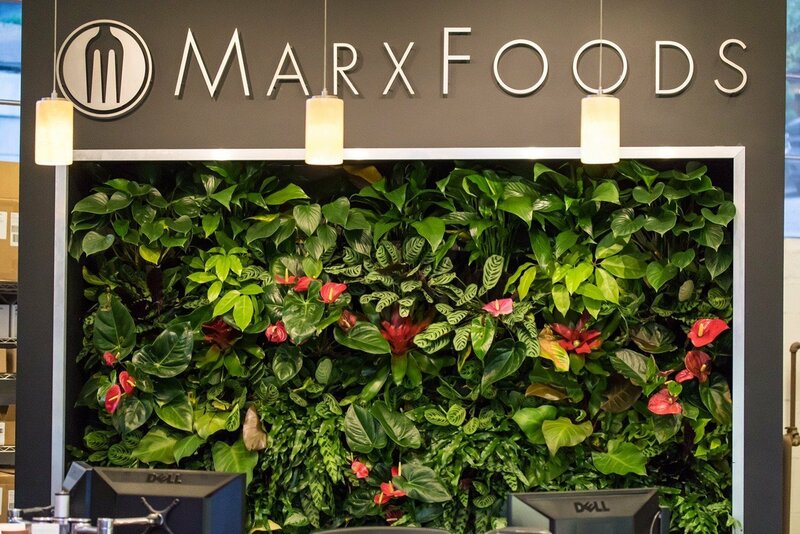 Rebecca selects plants as carefully as Marx Foods shops for their clientele. The garden includes Homalomena, Medusa Bromeliads, Kangaroo Paw Fern, Vresia (a mottled leaf bromeliad), Spathiphyllum, Anthurium, Aglaonema (has a good sprawling habit and fills in the edges”), Philodendron and Schefflera ‘Soliel,’ which has stunning chartreuse leaves. 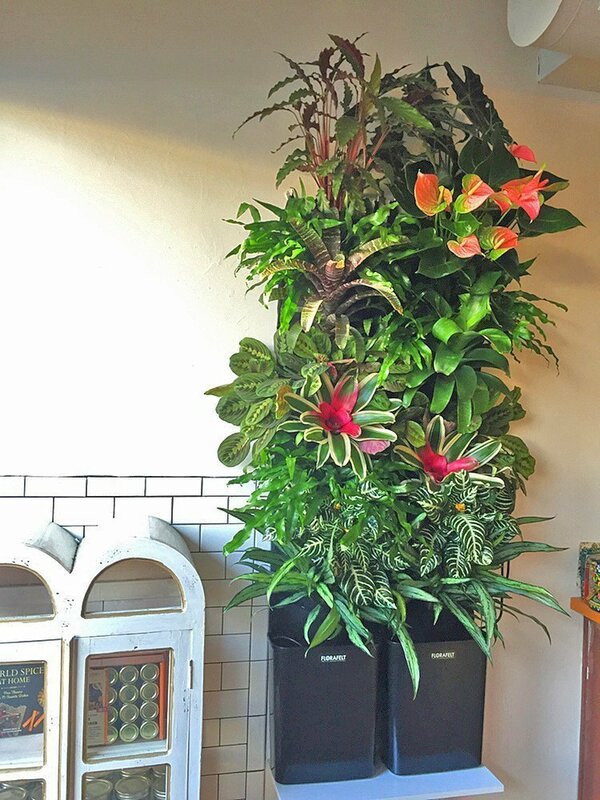 Florafelt Vertical Garden Compact Kits by Rebecca Sheedy, Floraform Design for Marx Foods, Seattle. 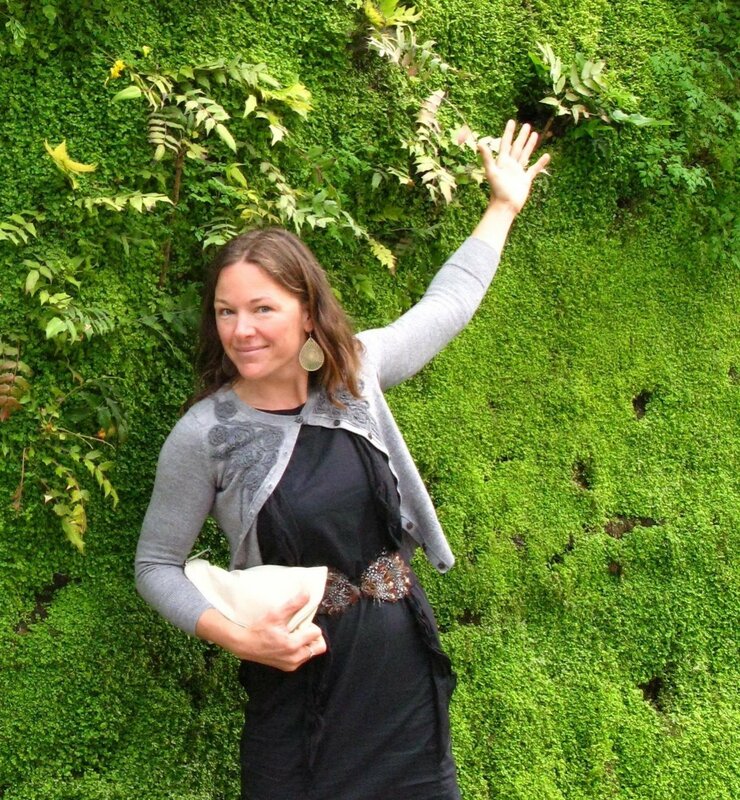 Since then, Rebecca has created distinctive and beautiful vertical gardens for restaurants, homes, wine shops, doctors’ offices, you name it. 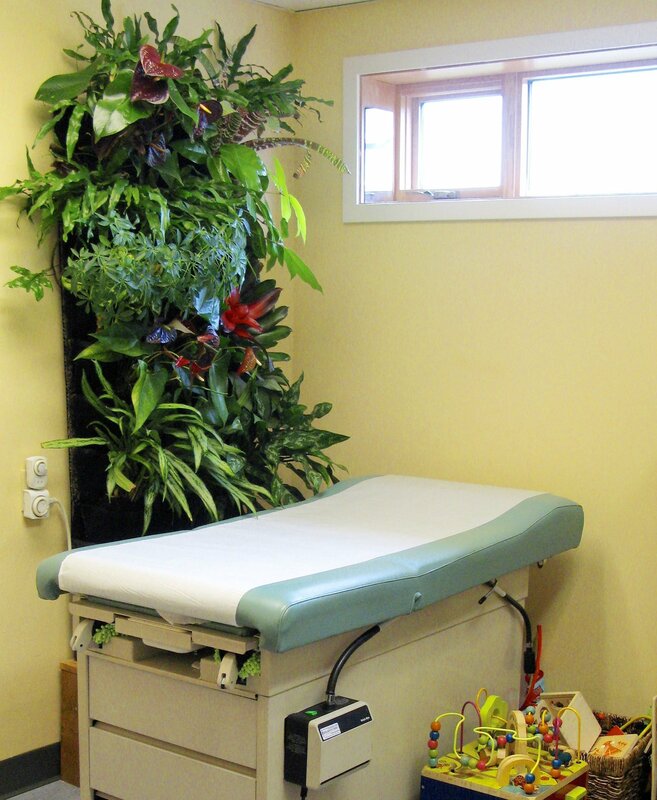 Interestingly, doctors request the gardens for their examination rooms. “There is a big alternative medicine scene here – doctors prescribe plants as medicine,” she says. 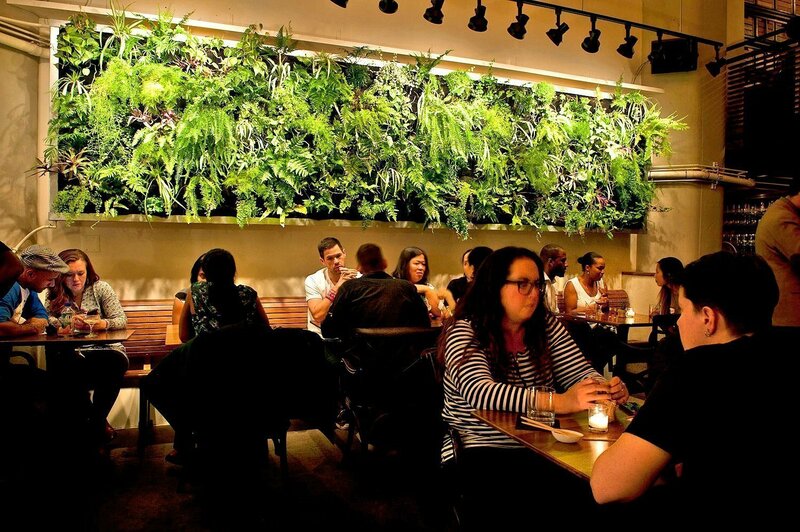 Florafelt Pockets vertical garden by Woodland Landscapes for Atrium Restaurant in DUMBO, Brooklyn. 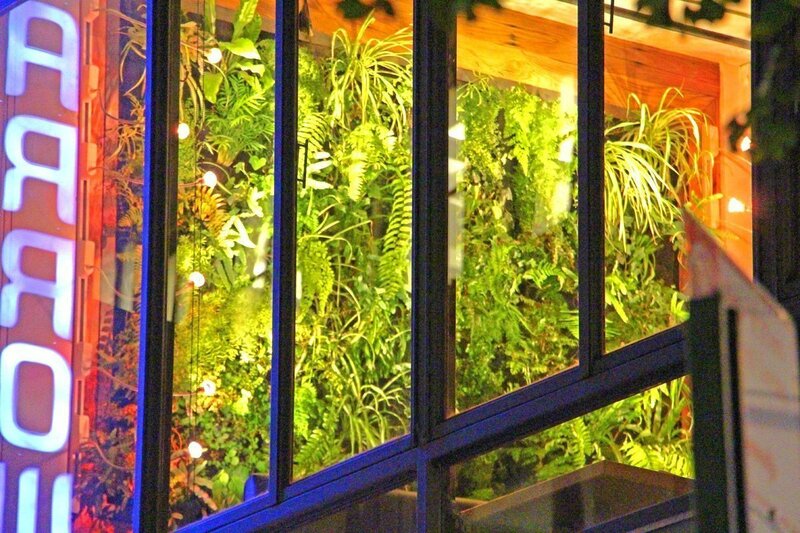 Grateful for the spent fury of Jonas, our thoughts turn to that other superstorm, Sandy – and recall a vertical garden so tough, a historic hurricane couldn’t bring it down. 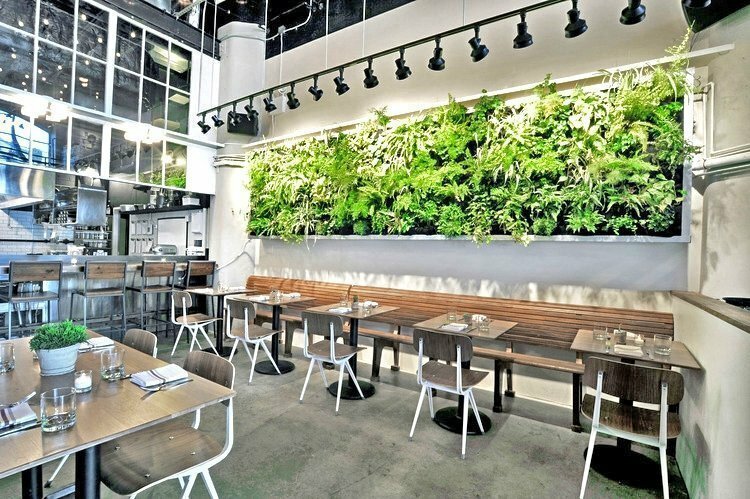 In fact, for renowned New York restaurateurs Laurent Kalkotour and Leslie Affre, and acclaimed landscape designer FireDean Schilling, the logical thing was to build two more. 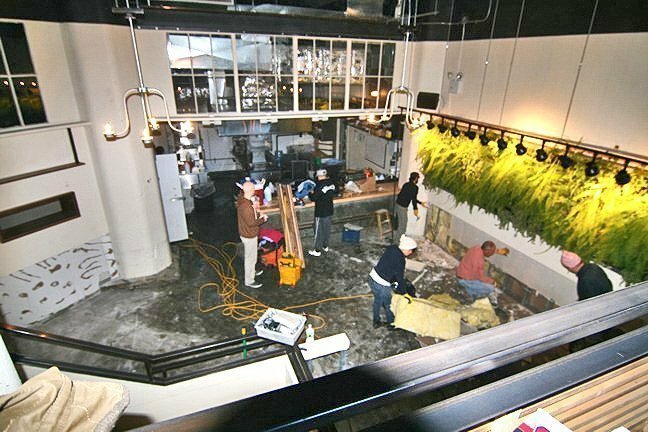 October 29, 2012: what is now Atrium DUMBO had been open just six months, following a year of pressure and preparation. The restaurant lies just a few feet from a waterside park in the eclectic and happening DUMBO (Down Under the Manhattan Bridge Overpass) neighborhood in Brooklyn. When Sandy hit, more than five feet of seawater barreled through the back door. Just about everything was demolished. The owners rang up one of their line cooks and then all went to the restaurant during the hurricane, but all measures to protect it were in vain. Closed for months, no federal assistance was provided to rebuild. About the only thing that survived was FireDean’s green wall. “It was kind of an inspiration. 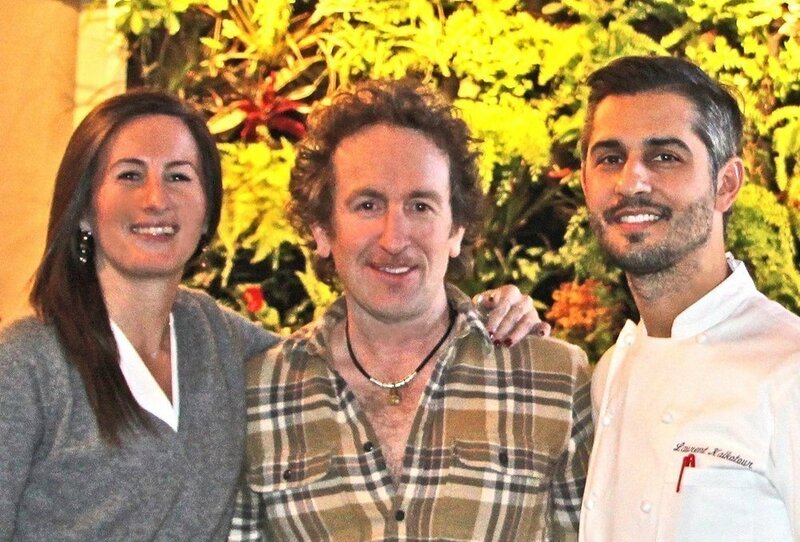 It looked pretty good, but with a completely destroyed restaurant around it,” he says. The owners brought him back, thinking it also needed replacing, but FireDean said not necessarily. “We took out most of the plants, cleaned them up, replaced them and fixed the irrigation system. We also kept the structure.” In addition, FireDean donated toward the rebuild, helped with the cleanup and promoted fundraising efforts. 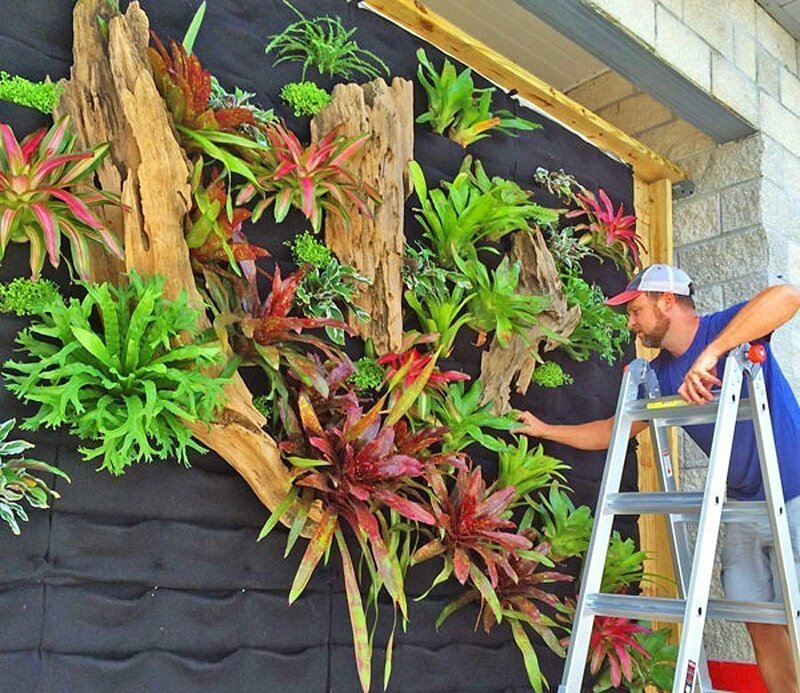 Seth Stottlemyer’s first vertical garden is a stunner! Trained in Washington, DC, apprenticed in New York, and now headquartered in Sarasota, this entrepreneur brings a little northern exposure to the sunny South. 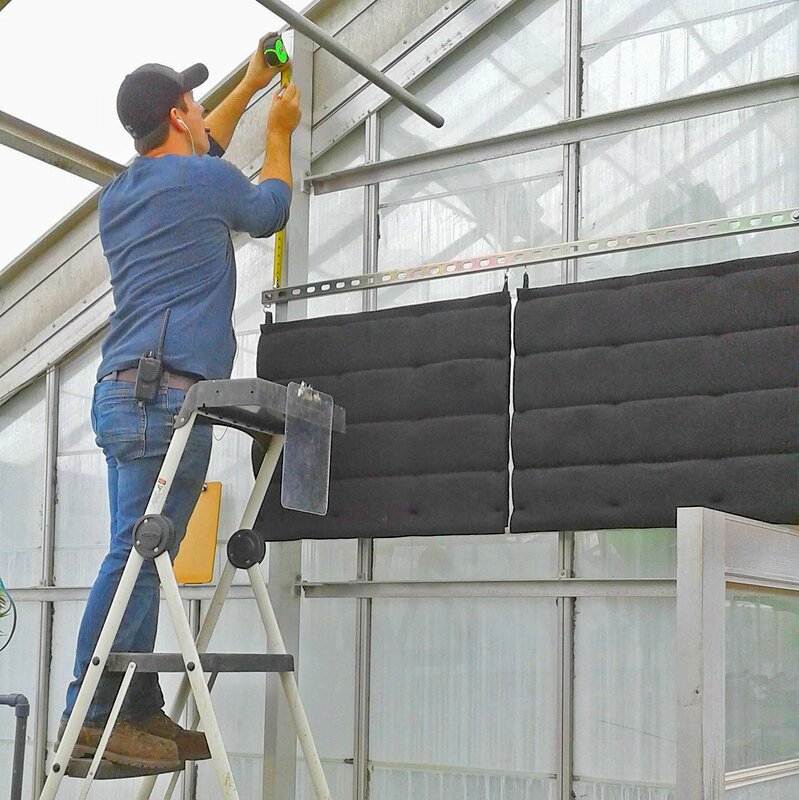 As a rising star landscaper, Seth is big on keeping up to date ─ not surprising since he managed energy efficiency programs at Con Edison, received professional certification from Green Roofs for Healthy Cities (headquartered in Toronto), and studied at the New York Botanical Garden. He apprenticed at the renowned Town and Gardens firm in New York City, rising to manage high profile residential and commercial sites. One might think that in Florida, only tropical plants that soak up the sun all day survive – not so. 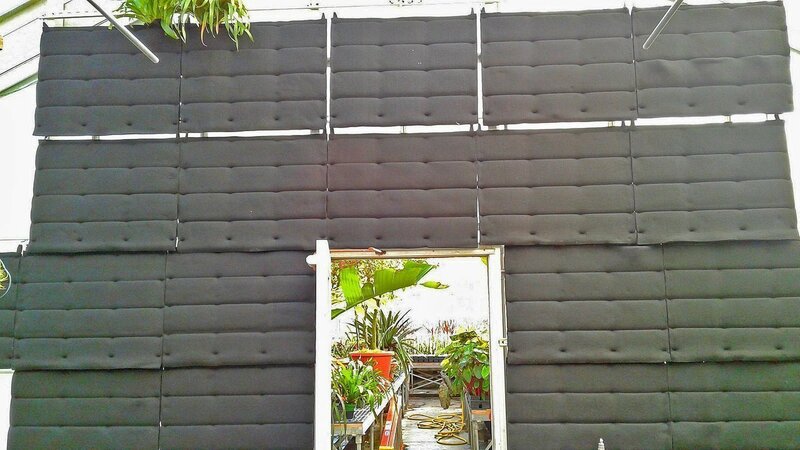 “Our vertical garden is north facing and doesn’t get a lot of direct sun. In fact, there is a slight roof overhang,” says Seth. So he created a masterpiece including ferns, philodendrons, bromeliads and peperomia, which work well in lower light. Peperomia’s many varieties include silver and burgundy stems and leaves for added punch; that and its attractively mounted compact habit make it a great wall companion. 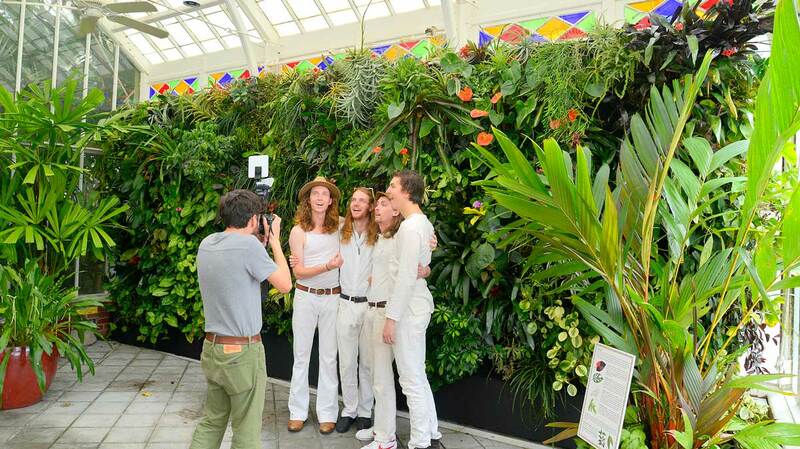 Needless to say, the living wall creates “A lot of buzz. I think this will take off big for me,” Seth says. 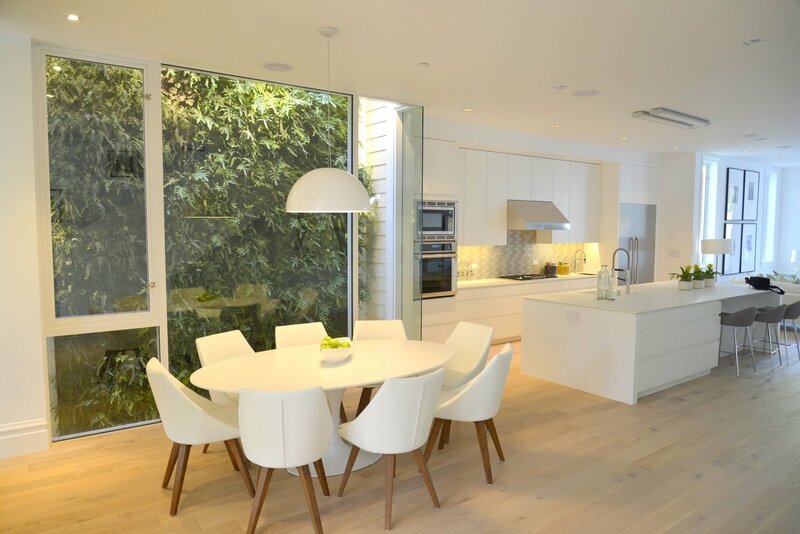 One project gained as a result is a 9×11-foot wall for a new client’s dining terrace, which is surrounded by indirect light. 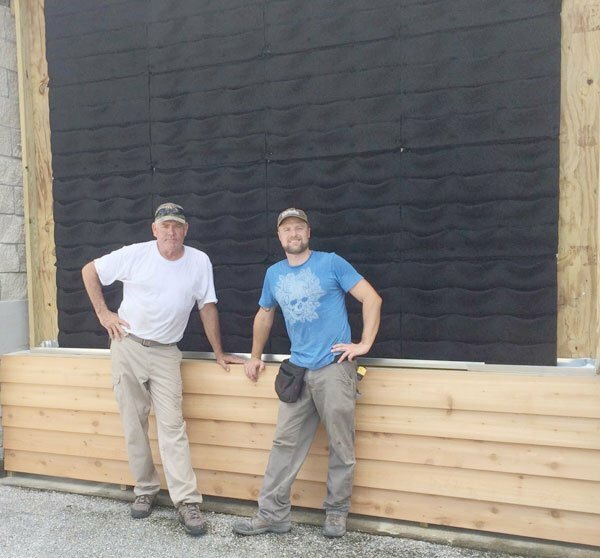 Seth grew up gardening and running the family business in Sarasota, but after years of work and education up north, he enjoys getting to know the southern plant palette again.